When these data are evaluated with the simplest model that includes only demographic variables the result indicate that women earn salaries that are 19% lower, compared to their colleagues who are white and male, but only 5% of the salary variation is explained by the model (Table 1). 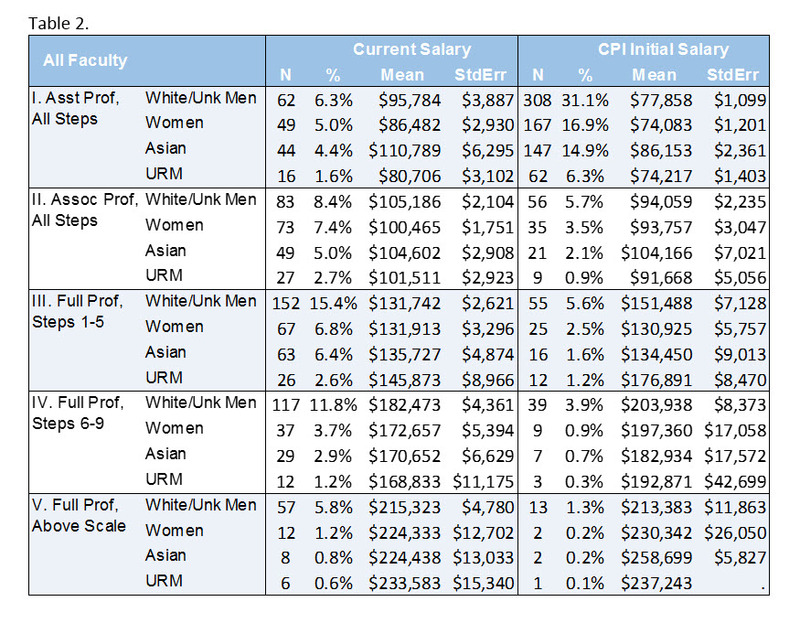 As additional explanatory variables are added to the model, salary differences diminish to less than 2% between women, Asian, and URMs when compared to white men; and the percentage of salary variation explained by the model increases to 91% (Table 1). This indicates that at the campus level, there is little evidence of salary inequity associated with gender and/or ethnicity. When controlling for rank and step, regression analyses show salaries are similar by demographic variables at the time of hire as well. The distribution of faculty among ranks is displayed in Table 2. The table, along with graphs of the data, reveals women and minorities predominately begin the lower ranks while the ranks in which white men begin is more evenly dispersed. The current rank for white men is also normally distributed while the distribution for others are skewed to the right. The results indicate there isn’t a statistically significant difference in progression rate means by either gender or ethnicity when compared to white male faculty, indicating there is no evidence of systemic biases against promotion at the campus level. Normative progression is defined in the Progression Matrix.